Every animal admitted to our Center is special and everyone gets great care but occasionally we get one that is just a little different and very rare. 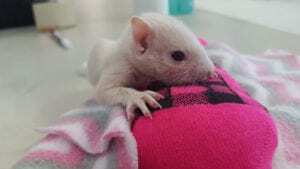 This happened recently when a white baby squirrel was admitted. We posted pictures on our Facebook page and I, like others, wondered if it was an albino. Because the squirrel has dark eyes it is most likely leucistic. Leucism is a partial loss of pigmentation but the eye color remains unaffected. Albinism is a congenital disorder and the eyes would appear pink or red. 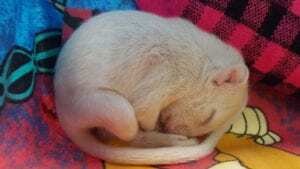 White squirrels are actually a mutation of the eastern gray squirrel. It is believed that white squirrels are the result of pet white squirrels that either escaped or were released into the wild. Brevard, North Carolina, seems to have the largest population of white squirrels and goes back to 1949 when a resident received a couple of them as gifts. They escaped and began breeding and now it’s estimated that one in three squirrels in Brevard are white. They have become a tourist attraction and are celebrated every year during the White Squirrel Festival. Another rarity is the black squirrel. Like the white squirrel, black squirrels are actually eastern gray squirrels with a genetic condition called melanism. This condition can occur in many species. In order to avoid predators, squirrels will zigzag back and forth. I think we’ve all seen squirrels trying to cross a street. Instead of running a straight line to safety, they will zigzag and the result often leads to an unhappy ending for the squirrel. A squirrel’s tail not only serves as a blanket in the cold days of winter but is also used as a way to communicate. It can warn other squirrels of danger, is used to help with balance and climbing and is also used during the mating season to attract potential mates. Gray, brown, black or white, we love them and are fortunate to be able to care for fox squirrels, eastern gray squirrels and flying squirrels. TWRC Wildlife Center is a 501(c)(3) organization that rehabilitates injured, orphaned and displaced wildlife. Please “like” us on Facebook and visit our website for great information and photos on wildlife.